Camden Council’s Regeneration team are working with the Green Space and Environmental Services teams to develop proposals to deliver new homes and landscaping improvements on the Tybalds estate additional to the proposed Better Homes programme repairs. You said: “Concerned by Oliver Twist Court – Too close to Blemundsbury”. We did: Early plans for Oliver Twist Court, a new block in front of Blemundsbury have been altered following comments from residents that this would make the lower floors of Blemundsbury feel cramped and overshadowed. We have instead proposed blocks at either end, preserving the open aspect of Blemundsbury. We did: We have responded to comments explaining the need for a lift for Devonshire by asking the architect to examine designing in this feature in an affordable way. 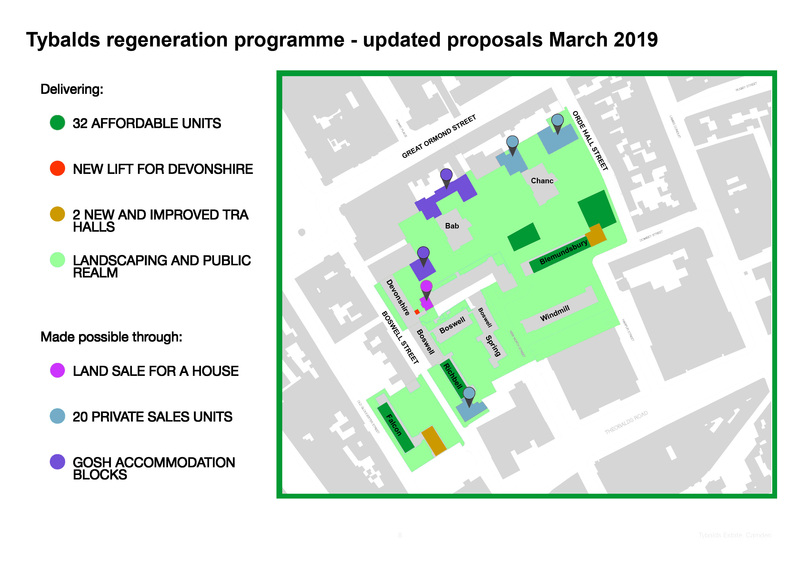 The latest proposals are summarised in the 2 April 2019 Tybalds regeneration updated proposals plan which you can download in the 'Related' section below. We are consulting estate residents and local people to develop the regeneration and new homes proposals prior to submitting a planning application. This will include drop in and information events on the estate and close collaboration with the Tybalds Residents Association. We will remain in touch throughout the programme.